I think a lot of the recent popularity has to do with English education in elementary schools; since Halloween is a non-religious holiday and, in its contemporary incarnation, is based on children wearing costumes, eating candy, and having fun, most of the customs are easy to explain and to base activities around for English classes and international/multicultural events for young learners. The generation of Japanese children that has grown up drawing jack-o-lanterns with ALTs and attending community Halloween parties is starting to rub off on the culture in general. That, and Japanese companies have figured out that Halloween can be used for seasonal goods–it’s fun, it’s exotic, and, even if they didn’t intend it to bring in the foreign consumers, it does. 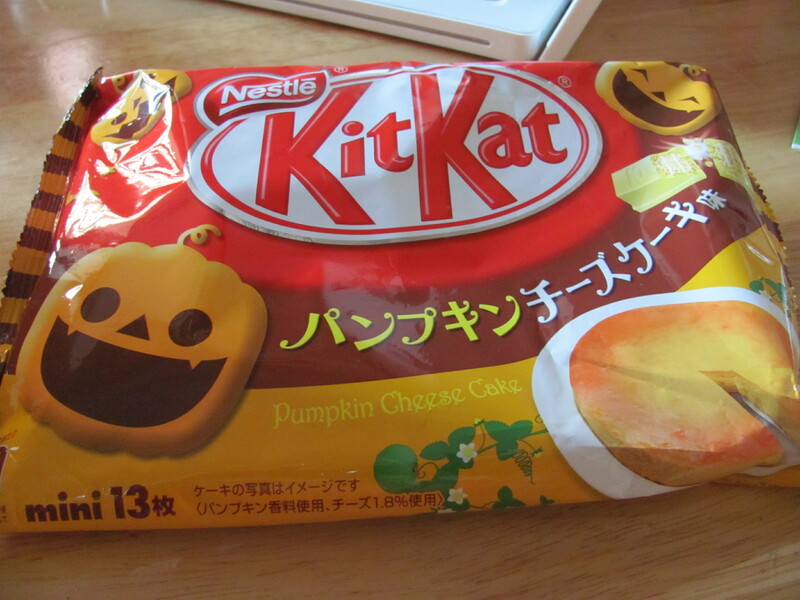 Halloween is my favorite holiday, When I see something in Japan with a jack-o-lantern or a ghost on it, I feel compelled to buy it or eat it, especially if it is pumpkin flavored. I love kabocha, of course, but I miss carving and eating orange American pumpkins, and I really miss all the pumpkin-flavored sweets and lattes at the store. 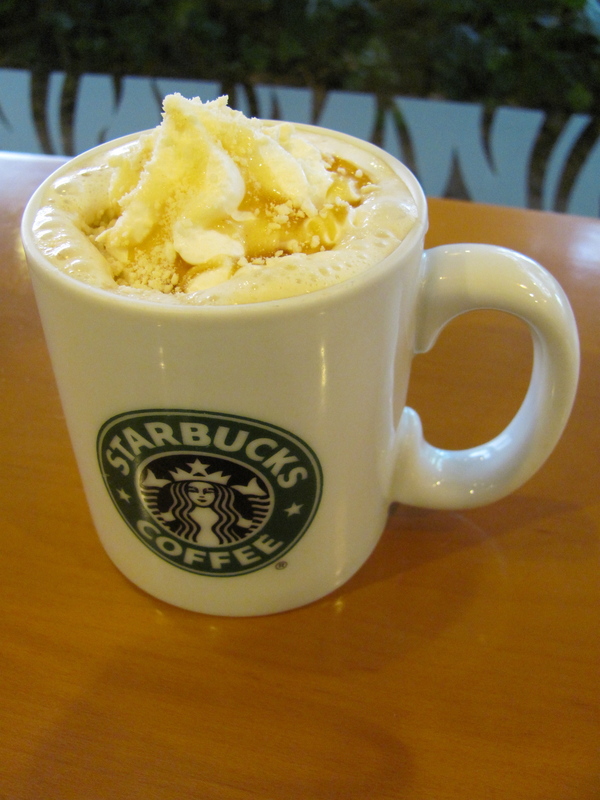 I don’t even like Starbucks, but I get a little torn up thinking about not having a pumpkin-spice latte when my Facebook feed explodes the day Starbucks starts selling them. I could make my own if only I could get my hands on some pumpkin puree. Latte or no, in hopes of documenting Japan’s increasing awareness and consumption of Halloween, I have tried to photograph any instances of Halloween marketing or goods I have seen in Kanazawa this October. 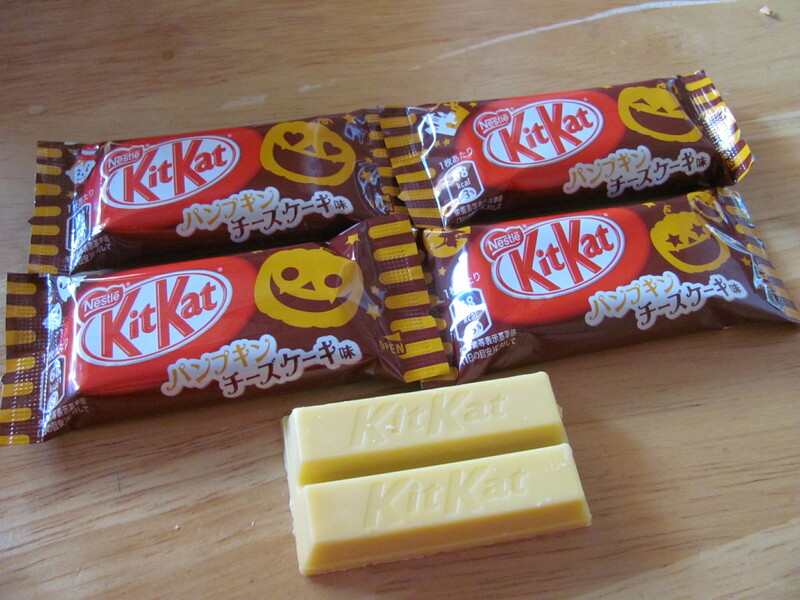 Today: Halloween Pumpkin Cheesecake Kit Kats (パンプキン・チーズケーキ). I first read about this flavor on Super Happy Awesome Fun Time, and finally picked some up this weekend at my supermarket. The wrappers have four different jack-o-lantern faces on them; one bag has 13 mini Kit Kats. I’m not sure what to make of this statement. This is, of course, from the country that thinks Americans eat KFC and cake** on Christmas. Sure, adults might make a pumpkin cheesecake for a Halloween party, but I think most of us are more likely to eat Kit Kats on Halloween than cheesecake. Maybe they’re on to something…. Stay tuned for more Halloween in Japan! **Not Stollen, but a straight-up Japanese-style cake with fluffy white frosting and strawberries. If Japanese people want to have KFC and Christmas cake on Christmas, more power to them, but please stop telling people that these are holiday foods in the US, okay? I really like finding the regional flavors! Do you know when the Halloween ones started appearing in stores? Very true! Valentine’s Day and White Day sort of leave me cold in either country, but I’m glad Halloween is making a home here, even if it’s not quite as spooky as it is back home! 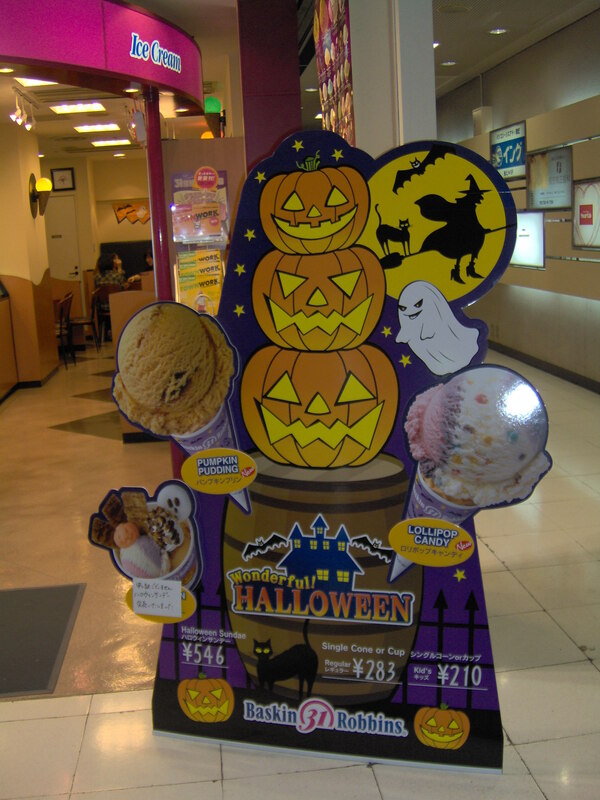 on 2011/10/24 at 10:00 pm | Reply Shar M.
It seems like the amount of Halloween goods has doubled in the last year! I wonder what the Halloween parties in the bar district are going to be like this year? Interesting point about Halloween’s current incarnation being secular and thus safe. I actually go out of my way to point out Halloween’s roots in Samhain so that it doesn’t become just another thing those crazy foreigners do. Plus, the fact that Samhain was a festival of the dead connects it to Obon and Dia de los Muertos, showing the cultures of the world really aren’t as different as people sometimes make them out to be. A lot of my students, between all three high schools I work or have worked at, have asked me, “Do you really do Halloween?” Some of them meant trick-or-treating in particular, but others have meant it as a whole. Yet there’s been a Halloween parade and costume contest in Hakata for the past 13 years, so I’m a bit surprised by their disbelief over it. When I did school visits to elementary, I usually said it was sort of like Obon and that people made jack-o-lanterns out of turnips and then pumpkins to ward off spirits. I think that going into the roots as Samhain at a high school level is a great idea–makes it a bit less unbelievable! If they’re in high school, though, they might not be up on events in the capital city.